Nestled among the many freight containers and fishing vessels is one of the newest members of SpaceX's recovery team. Nestled among the many freight containers and fishing vessels resides one of the newest members of SpaceX's recovery team: Mr. Steven. Space.com got a look at the boat during testing on Aug. 13, 2018. Read our full story here! On August 13th, Mr. Steven was spotted with a piece of a fairing in the net. SpaceX was likely performing tests to see how the net would perform with a fairing in it as well as testing procedures before its next attempt to catch a fairing. SpaceX conducted tests with Mr. Steven and a piece of a payload fairing on August 13. Here's a view of the fairing piece suspended above the net by a crane. A crane was used to repeatedly lift and lower a fairing half in Mr. Steven's net on Aug. 13, 2018. A close up view of the fairing piece in Mr. Steven's net. Mr. Steven made its debut in February. Acting as a giant catcher's mitt, the vessel sports new upgrades that include four new outstretched arms and a bigger net that spans 40,000 square feet (3,700 square meters). SpaceX was spotted conducting tests with Mr. Steven on Aug. 13, 2018 prior to the company's next West Coast launch, which is slated for September. Mr. Steven's net looks like it can support the weight of a fairing with no issues. Mr. Steven has an empty net following testing. Alss visible is a bouncy raft that the company may use to catch Dragon spacecraft in the future. 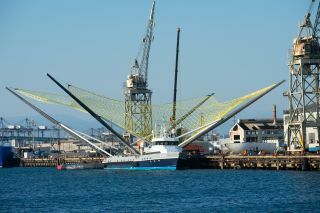 The fairing SpaceX used to test properties of Mr. Steven's net rests on the dock after the test is complete. SpaceX is trying to avoid the corrosive effects of salt water by catching fairing halves before they touch the water.